Hey everyone. I hope you had a great Sunday. I spent this cold Sunday doing a lot of cooking. Broccoli-cauliflower soup, roasted beats, chicken salad and slower cooker chicken and gravy. I love spending the day cooking, using real, organic ingredients. Speaking of organic ingredients, I subscribe to a delivery service that brings fresh, organic and local produce and natural groceries right to my doorstep. GreenBean Delivery is the name of the service and I have included the link to their website. www.greenbeandelivey.com. Check it out and see if they deliver where you live. Next week I’ll take a picture of my goodies on delivery day. I’m not sure if I have shared with you my current eating plan. My goal is to eat healthier and lose some weight. I have been making great progress so far this year. Since Jan 1st, I have lost 8.7 pounds. I’m really focused on finding a way of eating that is sustainable for life, not just to lose weight. I am eating healthy, real food; not the manufactured, tasteless food found in most grocery stores today. I’ll keep you posted on my progress. One last thing for tonight. I wanted to link to the recipe I mentioned above from the website Simple Nourished Living. Easy slow cooker chicken and gravy(www.simple-nourished-living.com/2013/easy-slow-cooker-chicken-and-gravy-recipe/. It was a delicious. If you are like me you have too many tomatoes this time of year. I can’t even think about eating another tomato. Last weekend I decided to preserve the wonderful tomato flavors to use sometime deep in the heart of winter, when I’m craving the flavors of summer. The following is the step-by-step process to make freezer tomato sauce. Start with several pounds of tomatoes. I used about 20 tomatoes various sizes. Next, grab your largest pot add enough water to cover to tomatoes about half way when they are added to the pot. 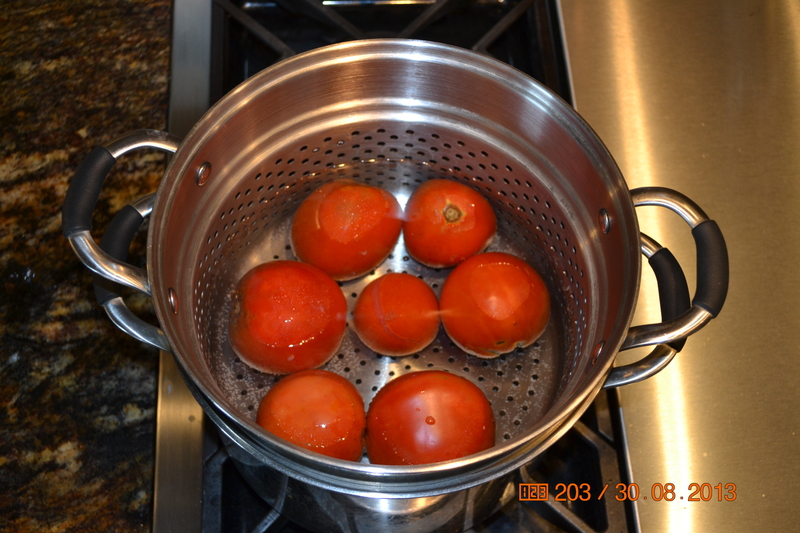 Bring water to boil and add 4 to 5 tomatoes to the pot. Leave tomatoes in pot for 5-6 minutes or until you see the skin start to pull away from the tomato. As you can see as the tomatoes start to cool the skin begins to almost fall off. Peel all the tomatoes and prepare your blender or food processor to puree the tomatoes. 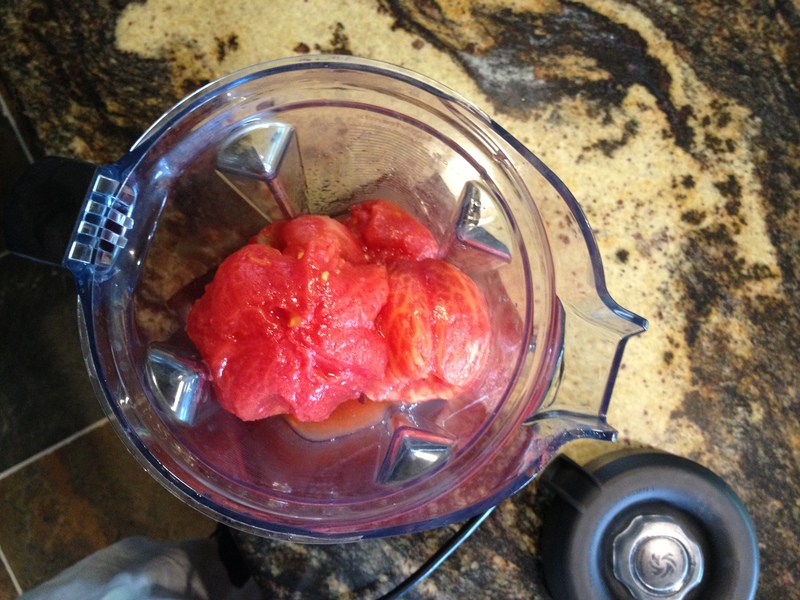 Place 4 to 5 tomatoes into the blender and blend until smooth. 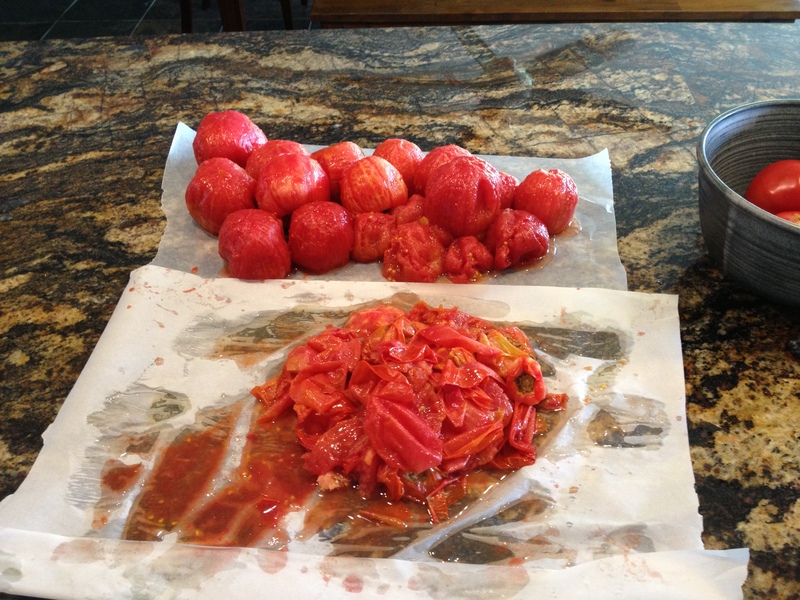 Continue process with the remainder of the tomatoes. 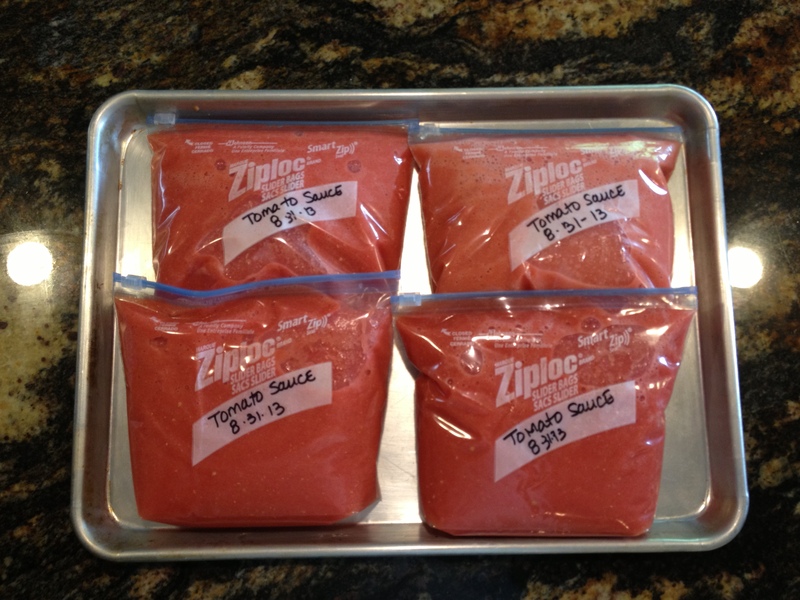 Prepare freezer Ziplok bags to hold your pureed tomato mixture. Pour tomato sauce into the freezer bags. Be sure you remove as much of the air as you can. I was able to get 4 bags out of the 20 tomatoes I started with. Place in freezer and enjoy throughout the winter to make soup, spaghetti sauce any recipe that requires the freshness of a summer tomato.